Medieval crusader Helmet with visor, shaped to protect the face, which falls below the neck with eye slits and holes, made entirely of steel, handmade with leather straps to be worn. This helmet is a battle-ready reconstruction of a high-medieval spangenhelmet. 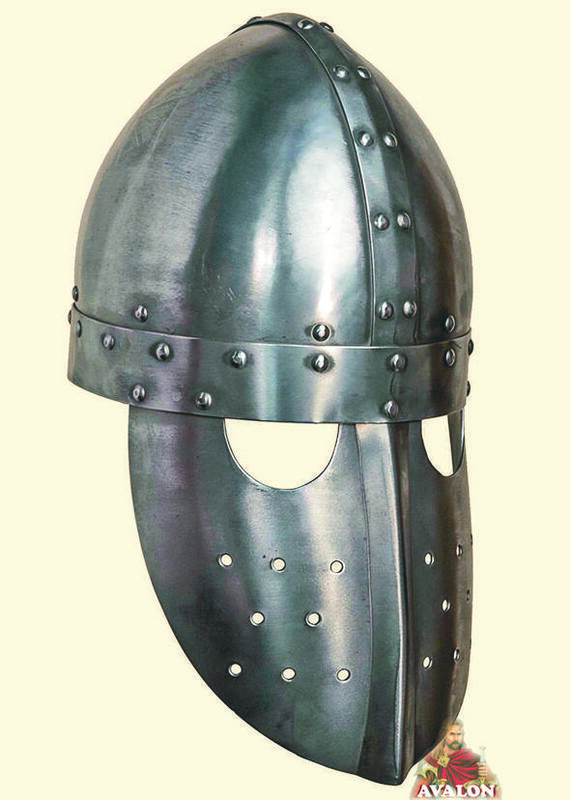 This kind of helmet has been worn by Crusaders during the 12th Century, usually in combination with a chain maille coif. The spangenhelm-construction, consisting of a calotte with crossed clips, is extremely robust. The large, curved face-plate gives additional protection. The eye openings allow a relatively good field of vision. This form of Spangenhelm with faceplate helmet was the forerunner of deeper, cylindrical helmets with greater facial protection, enclosed helmets, and eventually the great helm. The two chin straps are made of cow hide and have a brass buckle. Medieval Crusader Helmet is produced by highly skilled artisans in Italy, equipped with leather straps and external adjustable buckles to be worn.